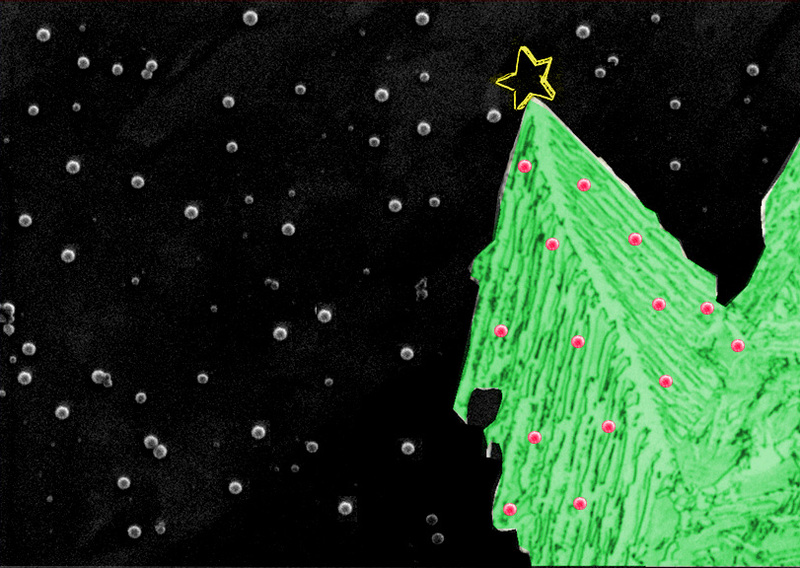 CENIM produced a nice Christmas card, which was made by competition from CENIM researchers. Since it was a collage, I felt license to further modify it with some false colour and further modifications. In a report to nature Sharpest cut from nanotube sword (now available here) researchers at Dresden University reported that carbon nano-tubes had been found in a Damascus sword. Link to TEM micrographs from Nature publication. It does seem possible that nanotubes could be contained in these steels, due to the high carbon content in the steel, and the low temperatures that were used during manufacture (I believe once made the Wootz steel is heated and forged repeatedly rather than remelted?). The heating techniques used could have introduced carbon in the form on nanotubes and there isn’t much reason for them to dissolve. I’m told that nanotubes could be produced from the burning of charcoal, leaves etc – they can form from hydrocarbons. With the high carbon content, it seems unlikely that any graphite (or nanotubes?) present would be dissolved into the matrix material. What does seem very unlikely is that the presence of nanotubes in anyway helps the manufacture or the mechanical properties of the swords. It seems fairly clear that the banding results from repeated mechanical deformation, and segregation of cementite. Cementite is only really brittle at low temperatures, it has recently been shown that having cementite present in steels of 1.5 wt% can be used to enable super plastic forming. 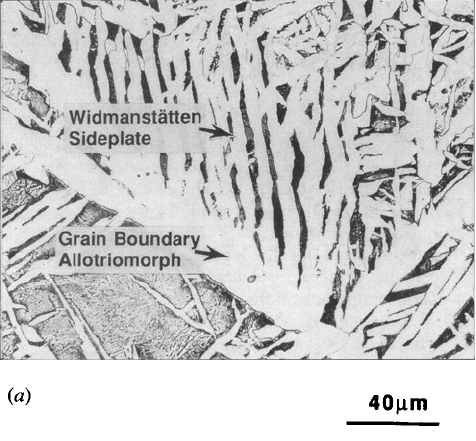 Sherby showed in 1995 that Wootz steel could exhibit superplastic deformation. Wadsworth and Sherby had eariler worked on superplastic forming of high carbon steels with additions of Chromium to stabilise cementite. In these steels cementite helped to keep a small ferrite grain size during hot working. J. Wadsworth and O. D. Sherby, Influence of chromium on superplasticity in ultra-high carbon steels, JOM, Volume 13, Number 12 / December, 1978. Thermal cycling and cyclic forging cause catalytic elements to segregate gradually into planar arrays parallel to the forging plane11. These elements may give rise to the growth of carbon nanotubes, which in turn initiate formation of cementite nanowires and coarse cementite particles. As the nanoscale structure of Damascus steel emerges, a refined interpretation of its remarkable mechanical properties should become possible. There are many claims that Damascus swords exhibited superior mechanical properties, but it seems likely that the comparisons that Hadfield had in 1912 have been surpassed in the last 90 years [Hadfield 1912]. It seems difficult to find any reported results of the mechanical properties of these swords. Strength values are available for the modern pattern welded swords but not for the original Damascus swords. There is available online a JOM article on the role of impurities in Damascus swords. Differences in microstructure along the sword shows a transition from pearlite to a divorced microstructure of ferrite and cementite. The tip would be a very hard pearlite with Rockwell C hardness around 32. Rockwell C hardness data were taken along the centerline of the transverse sections of all four swords in order to more fully characterize them. A large variation in hardness was found and is presented in Table II. The hardness correlated with the matrix microstructure. 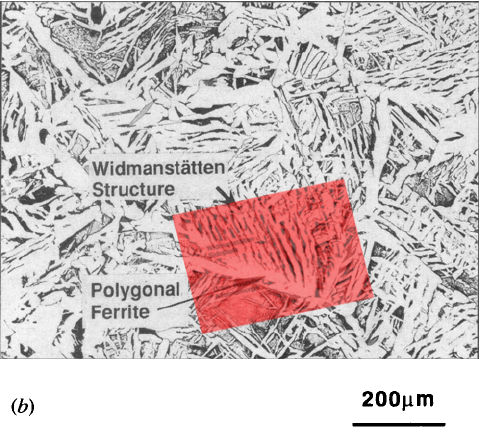 The matrix structure of the blades underwent a transition from pearlite at the thin tip to a divorced eutectoid ferrite + cementite at the fat end (thickness = 3-4 mm). Juha Perttula has reproduced a wootz Damascus steel and measured the Charpy Impact toughness and hardness. Juha Perttula. (2004) Wootz Damascus steel of ancient orient. Scandinavian Journal of Metallurgy 33:2, 92-97. It is reported that superior toughness can be achieved with a uniform distribution of carbides, and that dendritic segregation of chromium additions lead to the banded structure and are important to avoid graphitisation. 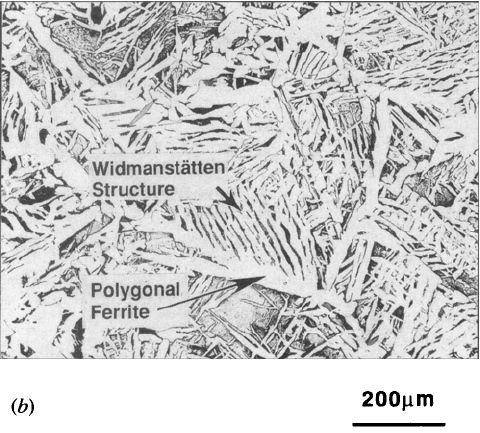 Mechanical properties are reported for both pearlite and tempered martensite microstructures. Pearlite microstructures had a Charpy impact toughness between 30-120 and hardness Rc=23. Tempered martensite had impact toughness 10-50 and Rc from 39-63.
genuine Damascus steels, Part II-Welded Damascus steels. SAMPE Journal, 31, 4 (1995). R. Hadfield, Sinhalese iron and steel of ancient origin, Journal of the Iron and Steel Institute, 85 (1912). I think this micrograph is pretty. Optical microscopy is useful to see what is really happening, it’s no use just going straight to high resolution without seeing what is happening on the millimeter and micrometer scale. A mixed microstructure of martensite and bainite. 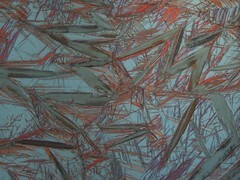 Red needles are bainite in this micrograph, larger brown plates are martensite, the white bits are the untrasformed austenite. The contrast is from viewing the etched surface (nital) using differential interference contrast.